Music and Art from the Time of Caravaggio and Gentileschi is the profoundly engaging culmination of a unique project envisioned by El Mundo artistic director Richard Savino. 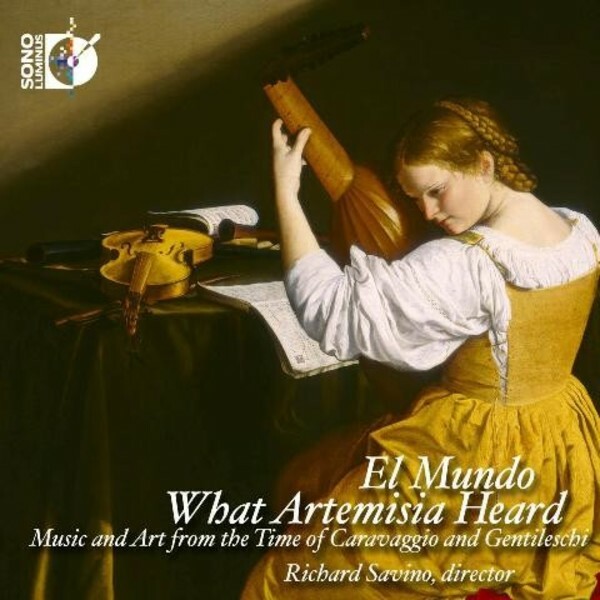 Enraptured over the work of female Baroque painter Artemisia Gentileschi, Savino, a baroque guitarist and lutenist, began to question why the music of Artemisia�s time is not as widely appreciated as the visual arts of the era. Recognizing a ubiquitous connection in popular music between the aural and visual (through vehicles such as music videos), Savino had the ingenious idea to integrate the sublime painting of Artemisia and her contemporaries directly with the equally sublime music these painters would have heard at the time. Featured alongside paintings by Artemisia and her contemporaries is music by composers Uccellini, Kapsberger, Ferrari, Frescobaldi, Mazzocchi, Gagliano, Caccini, Piccinini, Castello, Monteverdi, Corbetta, Falconieri, Rossi, Giramo and Lanier, as performed stunningly by El Mundo and distinguished soloists. El Mundo is a chamber group dedicated to the performance of sixteenth through nineteenth century Latin American, Spanish and Italian chamber music. Under the direction of guitarist/lutenist Richard Savino, El Mundo was formed in 1999 and is made up of some of today�s finest period instrument performers.